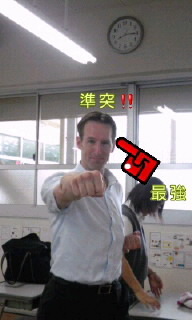 A junior high school student took my picture and added the words 'lunge punch' and 'strongest'! He miss spelled the kanji for lunge, but that's ok! Every morning I say hello to the junior high school students before their homeroom starts. This gives some of them the chance to try their English, make jokes plus try some karate. No gaijin allergies here I think!